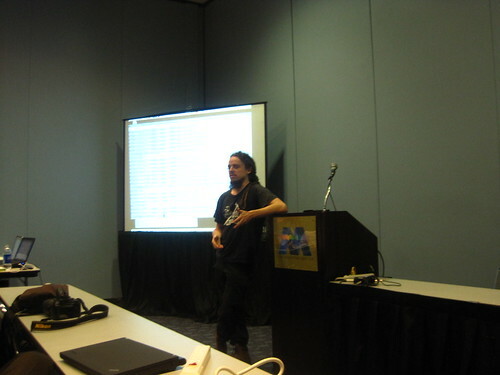 The Aegir project has seen vigorous development leading up to, during and after DrupalCon San Francisco April 2010. Unfortunately due to the volcano ash from Iceland, lead developer and Aegir author Adrian Rossouw got marooned in Frankfurt and was unable to join the rest of the team at Moscone. When Aegir 0.3 was released and I joined the development team, Adrian mentioned in the release notes that the 'bus factor' threatening to affect the progress of the project was reduced thanks to have extra hands on deck. In a way, although it was a devastating disappointment that he was unable to make it to DrupalCon, the opportunity arose to test what we renamed to be 'the volcano factor' and I think we did well under the circumstances. On the initial Code Sprint Sunday, Antoine and I sat down and ripped apart the Hostmaster install profile wizard. After a good 5 or 6 hours, Aegir became capable of being installed from the commandline directly, with no need to progress through the traditional browser-based wizard. Significantly, this install profile task wizard has always been one of the most common areas that new users struggle with when installing Aegir, as steps can be missed or misunderstood very easily. Now with the new install script (which is currently compatible with our dev-services branch in git), one need only install the usual dependencies (such as Apache, MySQL etc) and then execute the install.sh script, which takes care of the rest. Seconds later, a Login URL is given to you and you can immediately access the Aegir frontend! Amongst the sessions on Monday, we also participated in an informal Aegir BOF session that was organised by Brian Wood, much to our delight. In this session, we gave a brief overview on where Aegir was headed, but focused on hearing from you guys, our user base, on how you're using Aegir and what issues / benefits you've experienced that we could take back with us. Somewhere along the line, both Antoine and myself were interviewed by Lullabot for their famous Drupal Voices podcast series, where we discussed Aegir, best practices for dev/stage/live workflows, Drush and Drush Make. 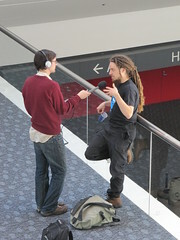 Expect to hear these interviews in the coming months as they trickle into the Drupalsphere. We felt the session was a success and it was great to see so many people show up and ask a lot of good questions. After the conference, we made it to the Thursday code sprint at San Francisco State University, and nailed a few more bugs / features! What was also discovered was that one can upgrade a vanilla Drupal 6.16 site to the latest Drupal 7 using our Migrate feature in Aegir, now that an upgrade path exists and drush updatedb succeeds. Wow! DrupalCon SF 2010 is over but progress continues. All the bulk of our hard work at the moment is within the "dev-services" branches of the provision and hostmaster git repositories on git.aegirproject.org, where our new object-oriented refactoring and introduction of the abstracted 'server' concept and service-based API is paving the way for true multi-server support.. not far away now! You're welcome to checkout these branches and start playing with it and fix some issues, or even just to test out the new command-line-only installation process. However, things are changing all the time, so it's volatile and there may be things that are very broken. Definitely don't use the dev-services branches in production! Hope to see you at the next DrupalCon! 1) the organising committee for DrupalCon itself - awesome job!